This part is made up of the following items: 1 x AE160JXYDEH Samsung 16kW EHS Monobloc Heat Pump 5th Gen. 1 x EHS-BOARD Samsung EHS Fast-Connect Install Board 1 x ECS300HPST-580 300L unvented, stainless steel DHW cylinder with twin heat pump and solar heat exchangers 2 x HP-GLY-CON-DTX Hydratech DTX High Efficiency Glycol Concentrate 25ltrs 1 x EXP-VES-24L-KIT Intatec 24L Expansion Vessel Kit 1 x FLEXI-HOSE-HP Pair of Flexi Hoses with 1 1 x HSYS-CLEANER-F3 Fernox F3 Heating System Cleaner 500ml 1 x HP-FEET Heat Pump Outdoor Support Feet x 2 1 x AN-STAT-WD Honeywell T6360 Wired Analogue Thermostat Heat pump installations perfected. 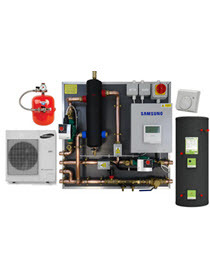 This package includes all the components you need for a complete 16kW EHS heating and hot water system and features the revolutionary Fast-Connect board with most of the componets already fitted. Note: The Fast-Connect board comes in one size: 850W x 830L x 205D. Please make sure there is sufficient room on the wall for it along with 100mm of clearance for servicing.